An Alternate History for "Archaeoraptor"
For those who didn't figure it out, yesterday's mystery bird teaser was a bit of a trick question. In fact, the bird, which I restored on a lark when working on other species, never existed at all. It was, in fact, a restoration of the famous fossil chimera, "Archaeoraptor liaoningensis". 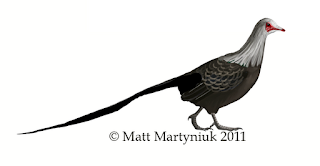 Two commentors did get it half right, guessing Yanornis, though the long tail would make that identification impossible (as euornithines, Yanornis had short tails with retractable fans of feathers). You'll notice I modified the image a bit since yesterday: Mickey Mortimer pointed out that Yanornis were not fully toothed, and while the premaxilla had teeth, there is a small edentulous anterior portion which may have supported small beaks. Despite being the most famous fossil forgery to come out of China, the "Archaeoraptor" debacle really is a success story for the peer review process. You can read a summary of the history of the specimen here. The upshot is that several researchers were suspicious of the chimeric specimen to begin with, and though they rather dubiously chose to submit it for publication anyway, their paper was subsequently rejected by two major journals, Nature and Science, before unfortunately being reported on without review in National Geographic magazine. In fact, it's not surprising that so many researchers were suspicious of the specimen's validity to begin with. At it combines the skull, body and wings of a Yanornis martini (a songlingornithid euornithine) and the tail of a Microraptor zhaoianus (a microraptorian dromaeosaurid), the "Archaeoraptor" specimen would have been a very odd anomaly had it been real, given our knowledge of bird evolution (even in 1999, when it was first revealed to the public). Note that many news reports have stated that the hind limbs of the composite specimen also come from a Microraptor or even a third, unidentified type of bird, Zhao et al. (2002) noted that they also come from a Yanornis martini. Anyway, I broke out Professor Farnsworth's What-If Machine to try to suss out how our current understanding of bird evolution would be different if the composite nature of the original "Archaeoraptor" specimen had never been discovered. Intuitively, it seems like a bird with the long tail of a dromaeosaurid combined with the advanced wing configuration and well-developed breastbone of an euornithine doesn't make much sense and would have eventually caused a rather extraordinary rearrangement of the bird family tree. 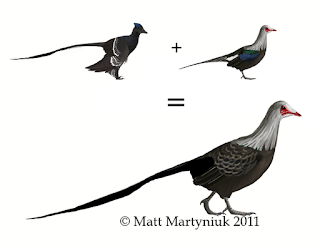 To test this idea, I employed the services of phylogeneticist extraordinaire Mickey Mortimer, who had coincidentally just finished coding Yanornis martini and entering it into a combined Theropod Working Group matrix. Mickey very helpfully humored my request and combined the relevant anatomy Yanornis and Microraptor into a single taxon, and plugged the result into a theropod phylogeny which included only other taxa known in 1999. "Okay, so what I've done is taken my Theropod Working Group analysis and restricted it to taxa described by 1999 (when "Archaeoraptor" was supposed to be described) and coded by the TWG [Theropod Working group - Ed.] by 2005. I've also limited it to those characters taken from the first TWG analysis (Norell et al., 2001), since I already posted those results on my blog (http://theropoddatabase.blogspot.com/2011/06/theropod-working-group-matrix-recoded.html) and Scott understandably doesn't want more of the Lori results being distributed before publication [Click here for the scoop on Lori, Scott Hartman's unpublished Morrison troodontid -Ed.]. So data-wise, this is equivalent to results I've already posted and with the exception of new specimens of old taxa (like the new Caudipteryx specimens in Zhou et al., 2000), which would be far too tedious to correct for, is representative of our knowledge in 1999. "Archaeoraptor" is represented by the Yanornis codings mixed with Microraptor tail codings. Many of those Yanornis codings are from specimens besides the Archaeovolans holotype, but I'm not going to take the time to go through and see exactly which characters can be coded from only that specimen. In total, 11 codings were changed between Yanornis and "Archaeoraptor". The entire matrix is 51 taxa and 210 characters." The result of Mickey's analysis was that "Archaeoraptor" ended up as the sister taxon to Confuciusornis, but with some caveats. First, no other pygostylians (the group uniting Confuciusornis and modern birds)were included, because Confuciusornis is the only pre-1999 taxon coded by the TWG. A complete test of "Archaeoraptor"'s 1999 relationships would require the addition of taxa like Patagopteryx, Songlingornis (which is a potential close relative of Yanornis), Cathayornis, Iberomesornis, etc. Because the only plesiomorphic character of "Archaeoraptor" relative to Yanornis and other euornithines proper are the "longer tail, elongate distal caudal prezygapophyses and rectangular proximal caudal centra", "Archaeoraptor" looks, for 1999 standards, like what we might have expected the sister taxon of Pygostylia to be like. Nevertheless, because the bulk of the specimen is so derived, Mickey reckons the presence of the long tail might not pull it away from euornithines even if other basal pygostylians were included (the long tail would then have to be considered a bizarre reversal). Mickey also tested a few alternate hypotheses to see how much support they would get. Perhaps the obvious conclusion for a scientists faced with an oddity like "Archaeoraptor" would be that it is probably a sister group to Pygostylia as mentioned above, or somehow intermediate between dromaeosaurids and pygostylians. Mickey tested this by forcing "Archaeoraptor", Confuciusornis, and dromaeosaurs to clade together, which resulted in only three extra steps: this would have been considered a pretty sound hypothesis given the small pygostylian sample. Interestingly, this arrangement would also have resulted in unenlagiines as basal eumaniraptorans and put Archaeopteryx in Troodontidae. Removing "Archaeoraptor" from the mix decreased the likelihood of a Dromaeosauridae+Pygostylia clade by five steps, which Mickey notes is still "plausible" but certainly less likely, and shows that "Archaeoraptor" would have created the kind of link between dromies and more advanced birds touted by the original NatGeo article. This leads me to speculate that "Archaeoraptor" may have provided "evidence" for the modular evolution of pygostylians directly from some traditional dromaeosaurs. Modular evolution refers to cases where major traits of a descendant group appear in a taxon which simultaneously retains major "primitive" or plesiomorphic traits of the ancestors taxa. One famous fossil example of this phenomenon is Darwinopterus modularis, which is a long-tailed pterosaur with a generally primitive, "rhamphorhynchoid" body plan, but which has a characteristically pterodactyloid-type skull. Had "Archaeoraptor" been accepted as real, we may now have believed that characteristic euornithine traits evolved first in the skull, forelimbs and torso of taxa which possessed otherwise dromaeosaurid tails (this is almost the exact opposite of how we view bird evolution today, with tail shortening coming very soon after the split between dromaeosaurs and pygostylians). As Mickey found, without more discoveries of basal pygostylian and ornithothoracine birds, our cladograms may have rendered dromaeosauridae paraphyletic with respect to modern birds. "Here's where I'd expect the inclusion of more pygostylians to have an effect though, since right now with only Confuciusornis, "Archaeoraptor" is effectively the most basal pygostylian. But if we had an omnivoropterygid, an enantiornithine, and other ornithuromorphs in there, Yanornis' birdy characters would nest it with those and make its dromaeosaurid-like tail a reversal." So, the discovery of more and better basal bird specimens may have been enough for "Archaeoraptor" to be regarded more and more as a curious side-branch of the avian family tree, less and less relevent to bird evolution as a whole: a euornithine with some rather inexplicable reversals. This would be similar to the way the relevance of the Piltdown Man to human evolution was exponentially reduced by numerous valid specimens before it was finally found to be a hoax. It wouldn't be DinoGoss without a discussion of taxonomical minutiae, and this is a question that has popped up on the net several times before: if "Archaeoraptor liaoningensis" included the holotype specimen of Microraptor zhaoianus, why isn't the former an objective senior synonym (that is, a name that is synonymous by virtue of being based on the exact same specimen, not a different specimen later assigned to an already named species) of the later? The crux of the argument is that the original National Geographic article that released the "Archaeoraptor" name did not satisfy the criterion for publication set forth by the International Code of Zoological Nomenclature (ICZN).The article, "Feathers for T. rex", was written by Christopher Sloan for the November 1999 issue of the magazine. While Sloan did technically coin the name "Archaeoraptor liaoningensis" by publishing it in a widely-distributed magazine (and the ICZN does not mandate that names can only be created in peer-reviewed journals), he did not make it clear that he was intending to formally erect a new taxon (usually done by specifying ("new genus and species", "gen. et sp. nov.", or some variation). Furthermore, he explicitly referred to the fact that a formal description of the species was forthcoming. Most observers have interpreted this as falling short of the ICZN requirements for naming taxa, and I don't know of any good reason to disagree. A more complicated factor is that, among the subsequent publications on the chimeric fossil, some authors did try to formally name the taxon and designate a lectotype (when a type specimen is found to actually represent two or more individuals, a lectotype must be chosen from among them to officially bear the name that originally applied to the lot). Noted BANDit Storrs Olson published an article in a 2000 issue of the Backbone newsletter of the US National Museum of Natural History in which he attempted to remove the tainted name from his own area of study, fossil birds. This is before many BANDits (the "birds are not dinosaurs" crowd) collectively reversed their positions and decided that dromaeosaurs ARE fossil birds after all, thus becoming MANIACs ("maniraptorans are not in actuality coelurosaurs"). Olson therefore designated the tail specimen as the lectotype. This would seemingly make "Archaeoraptor" the official senior synonym of Microraptor. Not so fast. Olson did not actually describe the specimen or convey intent to coin the name. Like Sloan, he referred the creation of the name to other authors (in this case, Sloan himself, in the mistaken belief that Sloan's article DID coin the name). So Olson effectively specified that the nomen nudum "Archaoraptor" should refer to the tail, but failed to officially create the name, let alone specify its lectotype. Because I initially got the inspiration for tomorrow's big post while working on the new restoration above, I thought I'd post it alone first as a teaser. First to correctly guess the species gets a shout-out! 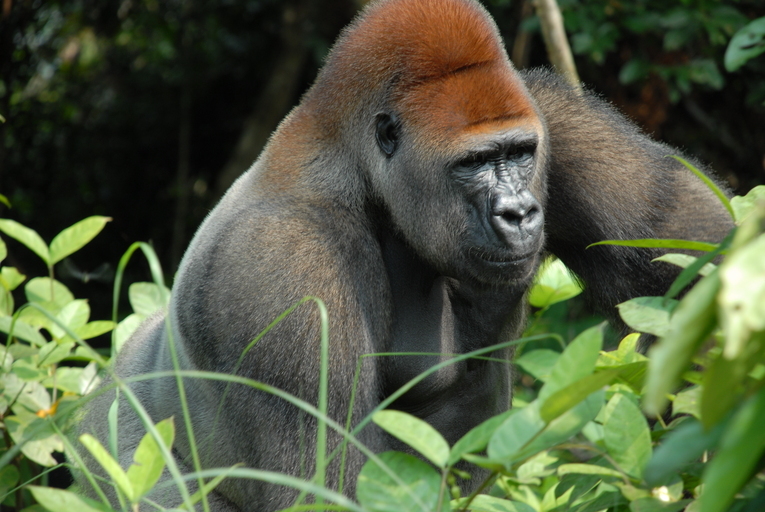 A gorilla is a type of primate. The gorilla is a primate. Gorilla is a primate. Gorilla gorilla is a primate. Hominidae is a group of primates. We use such oddly varying ways of talking about taxa. Image by Pierre Fidenci, licensed. "An artist's rendition of the gape of an Allosaurus species of dinosaur, based on the research of paleontologist Robert T. Bakker. Allosaurus was an active predator of large animals, and had the ability to open its jaws extremely wide. Studies suggest that it used its skull like a hatchet against prey, attacking open-mouthed, slashing flesh with its teeth, and tearing it away without splintering bones." "An artist's rendition of the dinosaur genus, Allosaurus, with it's jaws open fully, based on the research of paleontologist Robert T. Bakker. Allosaurus was an active predator of large animals, and probably had the ability to open its jaws extremely wide. Studies suggest that it used its skull like a hatchet against prey, attacking open-mouthed, slashing flesh with its teeth, and tearing it away without splintering bones." "An artist's rendition of the dinosaur family, Allosauridae, with it's jaws open fully, based on the research of paleontologist Robert T. Bakker. Allosauridae was an active predator of large animals, and probably had the ability to open its jaws extremely wide. Studies suggest that it used its skull like a hatchet against prey, attacking open-mouthed, slashing flesh with its teeth, and tearing it away without splintering bones." This caption obviously makes little grammatical sense, because we intuitively recognize that the family Allosauridae is collective (despite the fact that, like the genus Allosaurus, it is usually thought to contain only one species). But the genus Allosaurus is also collective, and for that matter, the species Allosaurus fragillis is a collection of populations and individuals. But these strange constructions are nearly universal in science writing, including (especially) formal science writing. In a way, this is a bit of an archaism. Think of the archaic-sounding phrasing in some old children's books, like "Tyrannosaurus: he was the king of the dinosaurs! His mortal enemy was Triceratops." Referring to an entire genus as a "he" ties into the anthropomorphic "roles" we assign dinosaurs ("Tyrannosaurus: he's a bad guy. Triceratops: he's a good guy). Mark Witton has previously written about this effect here. Similarly, referring to genera or even species in the singular places them in the same league as Godzilla: single, towering, fantastical monsters, rather than categories of normal animals. Referring to an animal as "the this" or "the that" is a another archaism. "The Tyrannosaurus was the dominant predator of his time." "The gorilla is the largest living primate." This is more correct than some of the other examples, but also strikes me as stodgy and archaic. Here's a quote from a 1985 paper: "The gorilla is more closely related to man than the chimpanzee is". Wouldn't "gorillas are more closely related to humans than chimpanzees are" seem more suited to the 21st (or even 20th) Century? But Tyrannosaurus is not that animals' name. It's the name of that animals' genus, the group which contains it.That animal is "a" Tyrannosaurus, it is not the genus Tyrannosaurus itself. Alternately, it is "a tyrannosaur", but it is not simply "tyrannosaur." Using lowercase "common names" is one easy solution, but one that can create a different kind of confusion. Is a "tyrannosaur" a Tyrannosaurus or any tyrannosaurid? Is Daspletosaurus a genus of tyrannosaur? This isn't a perfect example because there's no group named "Tyrannosauria", at least not yet. But think of how we use "dinosaur" instead of "dinosaurian", when it could just as easily be referring to the genus Dinosaurus. One solution would be to use such common names the way we do for living animals: common name followed by clarification. "This is a picture of a tyrannosaur (Tyrannosaurus rex)." "That is a picture of a tyrannosaur (Daspletosaurus torosus)." "An artist's rendition of an Allosaurus fragilis with it's jaws open fully, based on the research of paleontologist Robert T. Bakker. Allosaurus were active predators of large animals, and probably had the ability to open their jaws extremely wide. Studies suggest that they used their skulls like hatchets against prey, attacking open-mouthed, slashing flesh with their teeth, and tearing it away without splintering bones." "An" Allosaurus fragilis: it is an image depicting a member of that species, not an image of the "species" itself. Allosaurus "were" active predators, pleural, because Allosaurus is a grouping of dinosaurs. In my opinion, these slight changes in phrasing give a much more naturalistic feel to the description. It's clear that we're talking about a type of animal in the real world, not enumerating the abilities of an individual Pokemon character. Isn't it time we put some more thought into how we write about taxa? I think we should be trying to frame dinosaurs as parts of nature, not exceptions to it. Would it be helpful to change the way we talk about taxa, or is the existing method too entrenched and well-understood by those who will obviously know what you're talking about to bother?